Do you love Dim Sum? Are you always on the lookout for some authentic Suimai and Bao? Well, so am I and I was so glad to discover the jewel of a restaurant, China House embedded in the Grand Hyatt, Santacruz East. There’s now a new destination for Premium High Quality Dim Sum. 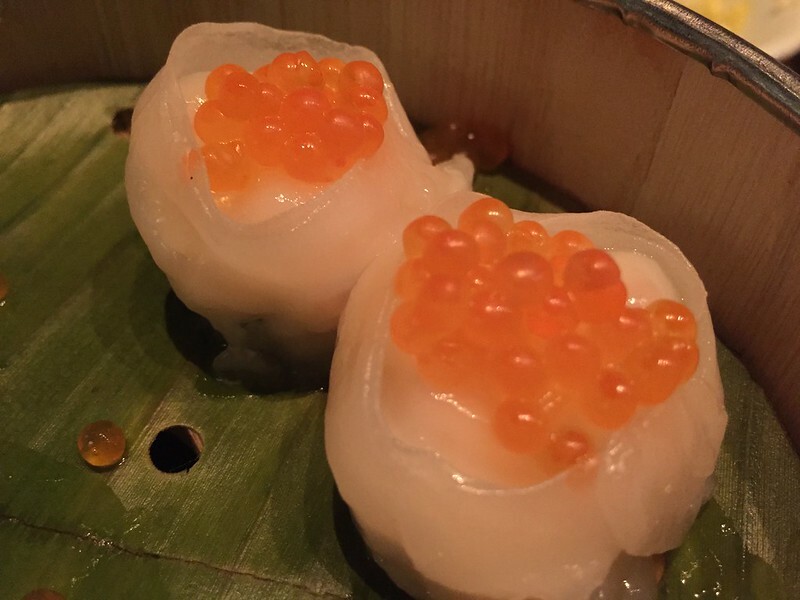 All Dim sum lovers have definitely visited Yauatcha and Royal China but China House has definitely carved a niche for itself with its fabulous and all natural food and flavourings. The restaurant is currently promoting its Yum Cha, comprising a variety of Dim Sum,Suimai,Buns,Rolls and a selection of Rice and Noodles as well. The Menu is available on á la carte basis but at discounted prices for the duration of this promotion, so make sure you make a visit soon! We started our meal with the Edamame Dumplings, Sea Bass Dumplings topped with Caviar and the Lobster Dumplings. I was already impressed with the unusual selection available as this was the first time I had seen sea bass and lobster dumplings in Mumbai. The sea bass dumplings were surely one of the major highlights of my meal! The delicately cooked fish placed within a fine wrap truly brought out the flavour and aroma of the sea bass and the caviar on top added the perfect punch. 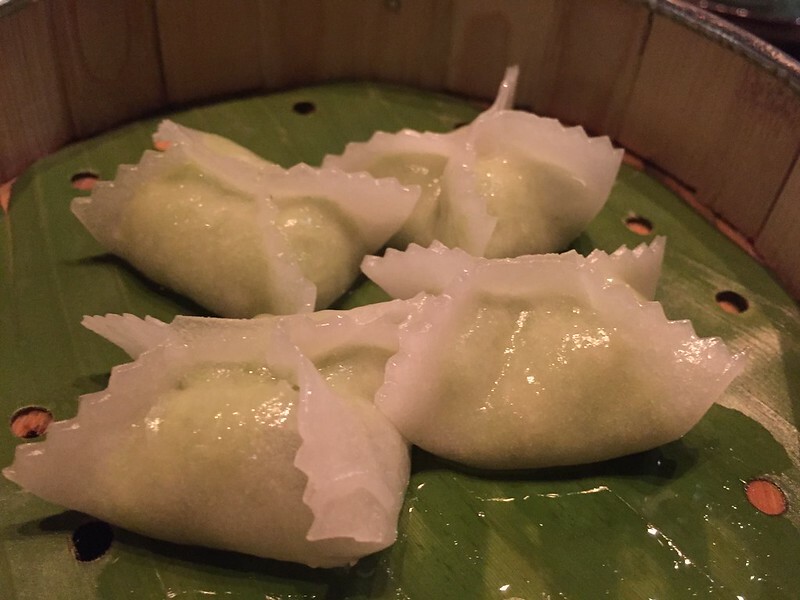 Although we weren’t very impressed with the Lobster Dumplings, the Edamame dumplings surely stole the show. Unlike other restaurants where the edamame paste is a smooth mixture, China House chooses to leave the beans as a coarsely ground paste. The coarse mixture adds a new texture to the soft dimsum and the edamame really sings through. This was followed by the Prawn Cigar Spring Rolls, Egg Fried Rice with Spinach Sauce and Singaporean rice noodles.All of these were absolutely stunning! 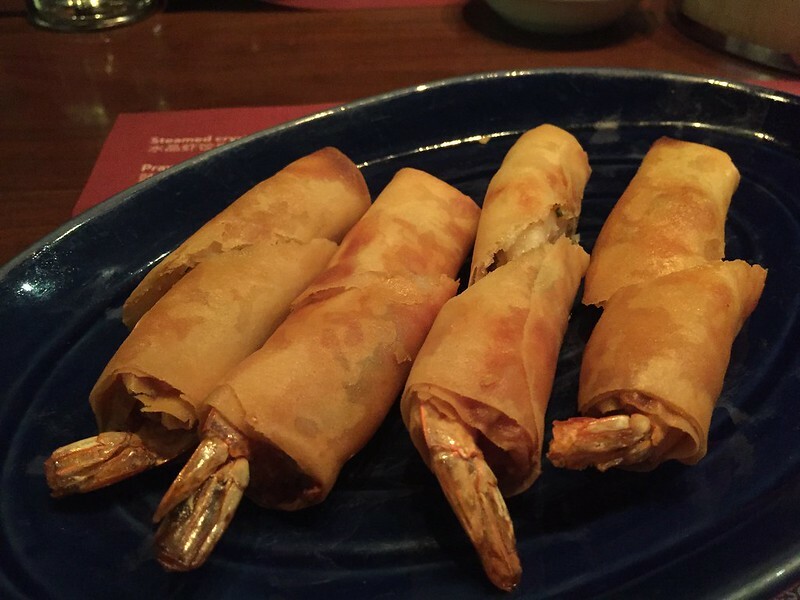 The paper thin coating of the prawns were astoundingly crisp and along with the sweet and tangy dipping sauce, they were a match made in heaven! 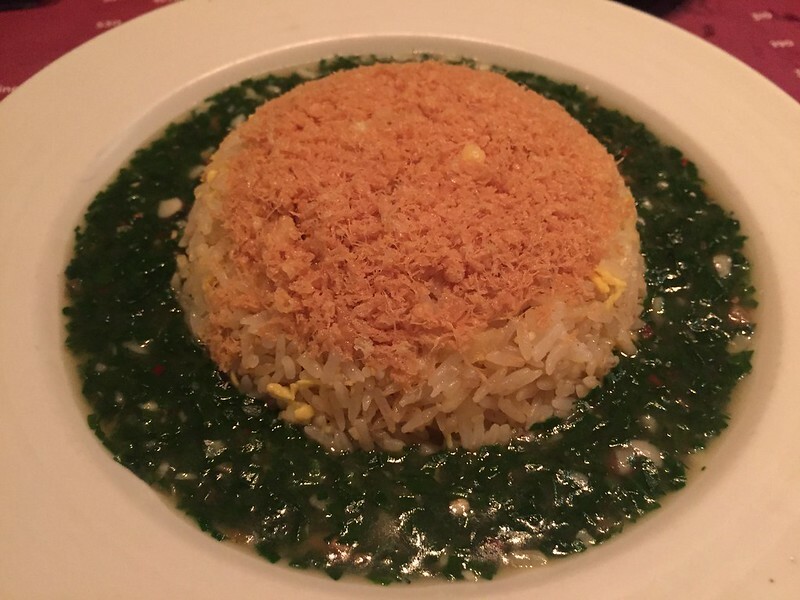 The egg fried rice was served with topped with fried egg crisps and aside a delicious spinach sauce. The stir fried Singaporean noodles were a good mix of vegetables and meats and a sure delight for lovers of rice noodles. The dish of the afternoon was without doubt the Roast Duck. 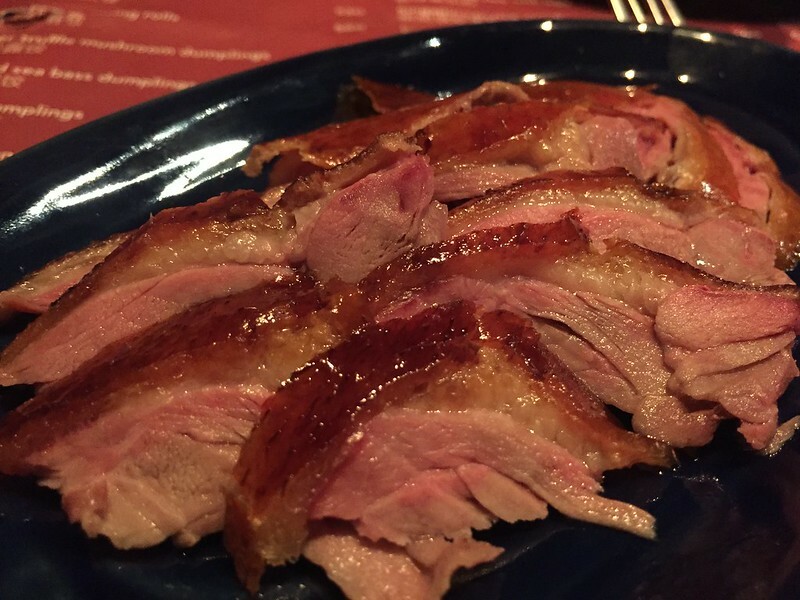 Cooking delicious duck is work of fine art. It’s so easy to dry out this delicate meat. To our surprise the duck was absolutely spot on! Crisp Cracling on the outside, fatty and soft on the inside, this dish surely transported me to duck heaven! It was surely the grandest finale to our main course. To say our meal ended on a sweet note would be an understatement for these formed the finest quality of desserts that I have had at any Chinese restaurant in a long long time! 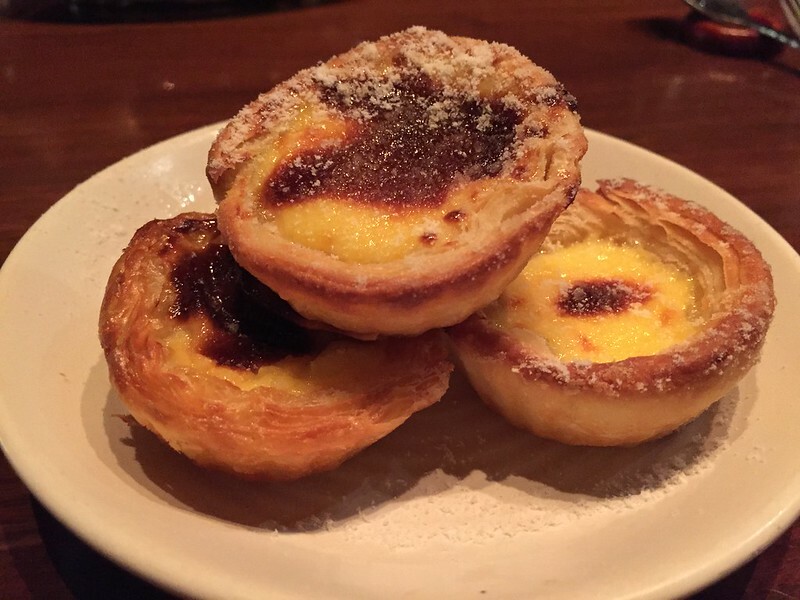 We first had the freshly baked Chinese egg tarts. The flaky crust, freshly pulled out of the oven just crumbled in my mouth and the oozy custard just left us begging for more! This was followed by one of the rarest desserts that I have laid my hands on recently.The Green Tea Tiramisu! Soft cake soaked in the perfect concentration of green tea layered with light fresh cream and garnished with crushed tea leaves. Need I say more? It was absolutely Gobsmacking! 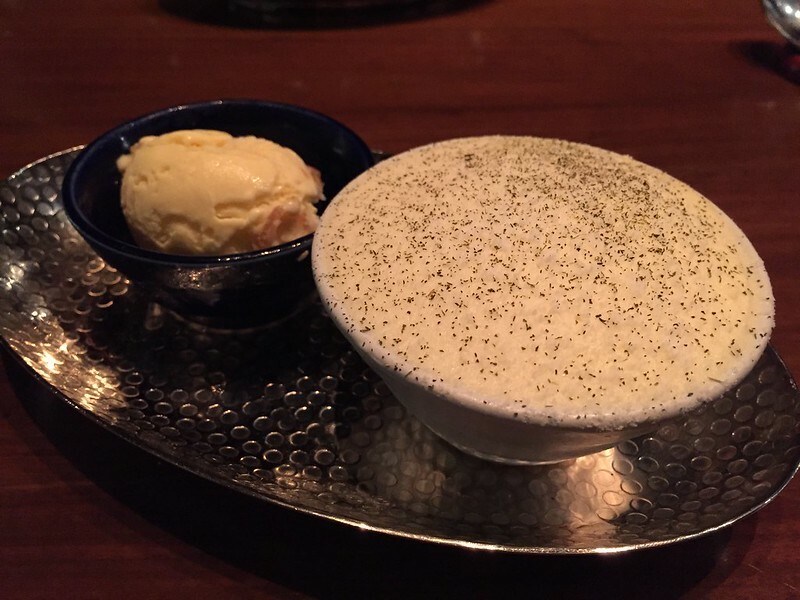 The restaurant also serves a range of delicious ice creams, each better than the other! We thoroughly enjoyed our meal at China House and you can take my word when I say that the food is a hundred percent authentic as I’m sitting in China whilst writing this review. In the past 20 days I’ve tasted the dumplings, Sui Mai and Bao’s in Hong Kong, Shanghai and Guangzhou and I can assure you that The Grand Hyatt is bringing China to your table!